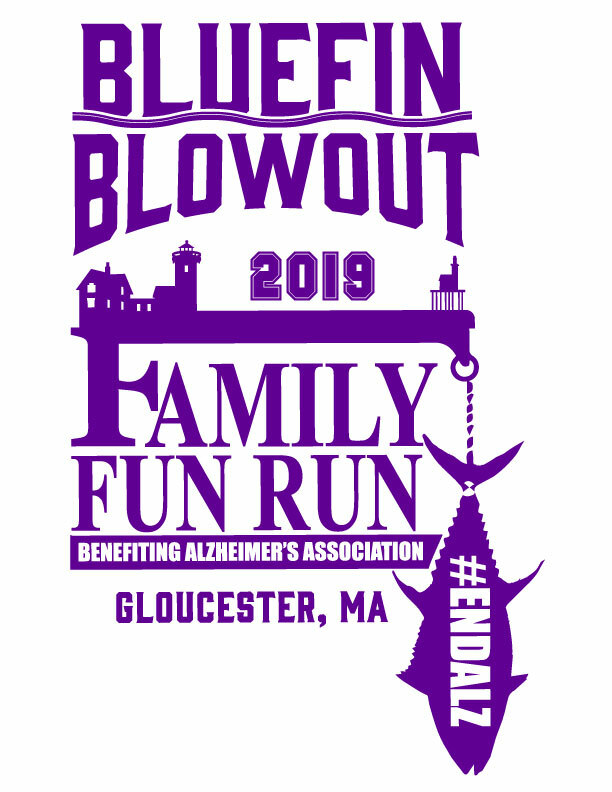 Join us on Sunday, May 19th at Stage Fort Park, Gloucester for the Lyon-Waugh Bluefin Blowout Family Fun 5K, benefiting the Alzheimer’s Association! Run, walk, or stroll from Stage Fort Park to Hammond Castle and back to Stage Fort Park for a 5K loop. 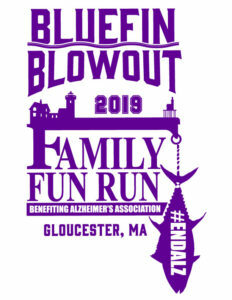 Enjoy the beautiful Cape Ann waterfront and fresh ocean air while raising money for the Alzheimer’s Association. 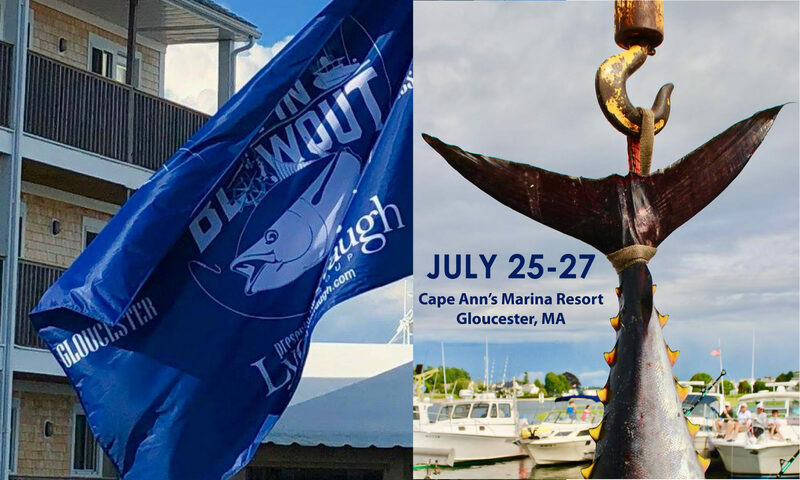 Meet us after the race at Cape Ann’s Marina Resort for the after-party featuring signature cocktails from our sponsors: Tito’s Handmade Vodka, Goslings Rum, and The Botanist Gin. *Please fill out one registration for each participant! Want to support the cause, but unable to attend/participate in the 5K? 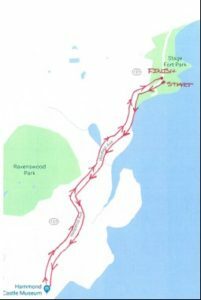 I UNDERSTAND THAT WHILE PARTICIPATING IN THE 2019 LYON-WAUGH BLUEFIN BLOWOUT FAMILY FUN 5K, I WILL BE USING PUBLIC AREAS AND FACILITIES WHERE MANY HAZARDS EXIST AND I AM AWARE OF AND APPRECIATE THE RISKS THAT MAY RESULT. I AM ALSO AWARE THAT ACCIDENTS MAY OCCUR DURING THIS EVENT, WHICH COULD RESULT IN SERIOUS INJURY OR DEATH. I AM VOLUNTARILY PARTICIPATING IN THIS EVENT WITH KNOWLEDGE OF ALL SUCH RISKS. IN CONSIDERATION OF THE ACCEPTANCE OF THIS REGISTRATION ENTRY, I ASSUME FULL AND COMPLETE RESPONSIBILITY FOR ANY BODILY INJURY, PERSONAL INJURY, ILLNESS OR PROPERTY DAMAGE THAT MAY RESULT FROM MY PARTICIPATION IN THE EVENT, AND I (ON BEHALF OF MYSELF, MY HEIRS, PERSONAL REPRESENTATIVE AND ASSIGNS) HEREBY RELEASE, INDEMNIFY AND HOLD HARMLESS EVENT STAFF, THEIR AFFILIATES AND THEIR RESPECTIVE OFFICERS, EMPLOYEES, AGENTS AND REPRESENTATIVES, INCLUDING HIRED VENDORS & VOLUNTEERS., FROM (1) ANY AND ALL CLAIMS WITH RESPECT TO LOSSES, INJURIES, AND LIABILITIES, OR DAMAGES (COLLECTIVELY, “CLAIMS”) MADE BY ANY THIRD PARTY ARISING FROM OR RELATED TO MY PARTICIPATION IN THIS EVENT OR (2) CLAIMS THAT I HAVE OR MAY HAVE IN THE FUTURE BASED UPON ANY ACTS OR OMISSIONS, WHETHER KNOWN OR UNKNOWN, RELATING TO, ARISING OUT OF, OR IN CONNECTION WITH THE EVENT, WHETHER THE DAMAGES BE CAUSED BY MYSELF OR BY THE NEGLIGENCE, OF ANY DEGREE, OF THE EVENT STAFF OR OTHER PERSONS OR ENTITIES ASSOCIATED WITH THIS EVENT. I PERMIT AND AUTHORIZE THE FREE USE AND PUBLISHING OF MY NAME, IMAGE AND PICTURE IN WEBSITES, BROADCASTS, TELECASTS AND THE PRESS AS IT PERTAINS TO THIS EVENT. I HAVE CAREFULLY READ THIS WAIVER, INDEMNITY AND RELEASE OF LIABILITY AND FULLY UNDERSTAND ITS CONTENTS. I AM AWARE THAT BY SELECTING THE “I AGREE” BUTTON THAT I AM AGREEING TO ITS TERMS, INCLUDING WAIVING LEGAL RIGHTS. KNOWING THIS, I AGREE TO THESE TERMS OF MY OWN FREE WILL. THIS AGREEMENT IS INTENDED TO BE AS BROAD AND INCLUSIVE AS PERMITTED BY THE LAWS OF THE STATE OF MASSACHUSETTS AND SHOULD BE INTERPRETED IN ACCORDANCE WITH COMMONWEALTH OF MASSACHUSETTS LAW. IF ANY PORTION OF THIS AGREEMENT IS HELD TO BE INVALID, IT IS AGREED THAT THE REMAINDER SHALL CONTINUE TO HAVE FULL LEGAL FORCE AND EFFECT. AS THE PARENT OR LEGAL GUARDIAN OF A MINOR UNDER THE AGE OF 16 SEEKING TO PARTICIPATE IN THE EVENT, I HEREBY PERMIT SAID MINOR (“MINOR”), TO PARTICIPATE IN THIS EVENT AND I HEREBY VERIFY THAT I FULLY UNDERSTAND, AGREE TO AND ACCEPT THE TERMS OF THIS AGREEMENT ON BEHALF OF THE MINOR. IN ADDITION, I CERTIFY THAT I AM THE PARENT OR LEGAL GUARDIAN OF THE MINOR NAMED IN THIS AGREEMENT AND THAT I AM ACTING IN THAT CAPACITY. I ACCEPT RESPONSIBILITY TO INFORM THE MINOR THAT EVENT STAFF AND VOLUNTEERS HAVE THE RIGHT TO DISQUALIFY AND DISMISS ANYONE THAT MAY CAUSE DISTURBANCE DURING THIS EVENT. WITHOUT LIMITING ANY OF THE FOREGOING REQUIREMENTS, I ALSO UNDERSTAND THAT I AM SOLELY RESPONSIBLE FOR FACILITATING THE PROPER TRAINING AND INSTRUCTION THE MINOR MIGHT REQUIRE TO PREPARE FOR THE EVENT, INCLUDING PHYSICAL PREPARATIONS, RELATED AND APPLICABLE TRAFFIC RULES AND GENERAL RUNNING/WALKING SAFETY. I UNDERSTAND THAT A RESPONSIBLE ADULT OVER THE AGE OF 21 MUST ACCOMPANY EVERY MINOR AT ALL TIMES DURING THE EVENT. I UNDERSTAND THAT MY ENTRY FEE IS NOT REFUNDABLE.